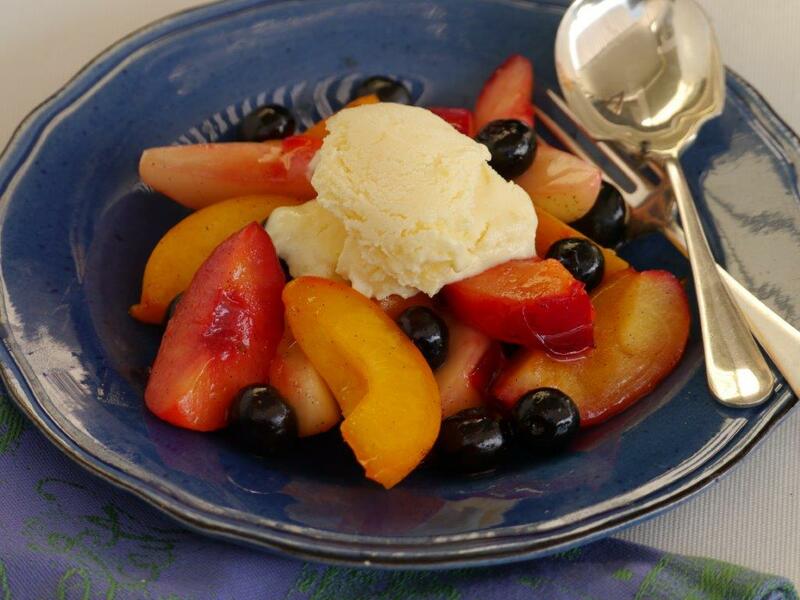 For this recipe have a variety of fruit or just one or two types – here I used 2 large plums, 2 apricots, a white-fleshed nectarine, a peacharine and a handful of blueberries. I think mangoes and pineapple would also work in the recipe and you could replace the blueberries with any other red berry as they’re added at the end. Halve and de-stone each piece of fruit. Cut each half in half again and if the pieces still look too big, half them again. In a frying pan melt 1-2 tbsps of butter (or you could use 1 tbsp olive oil) and add 1 vanilla pod split in half, 1-2 sprigs of fresh thyme, 1 tbsp runny honey and 2-3 tbsps your favourite liqueur (I used the same one as the first recipe). Let this all gently sizzle and start to caramelise. Try and scrap some of the seeds out of the vanilla pod so their flavour infuses into the syrup. Add all the cut up fruit except the blueberries. Toss the fruit around so all pieces are covered in a little syrup. Cook gently for 2-3 minutes until the fruit starts to soften. At the last minute add the blueberries. Serve immediately with a little cream or frozen yoghurt. 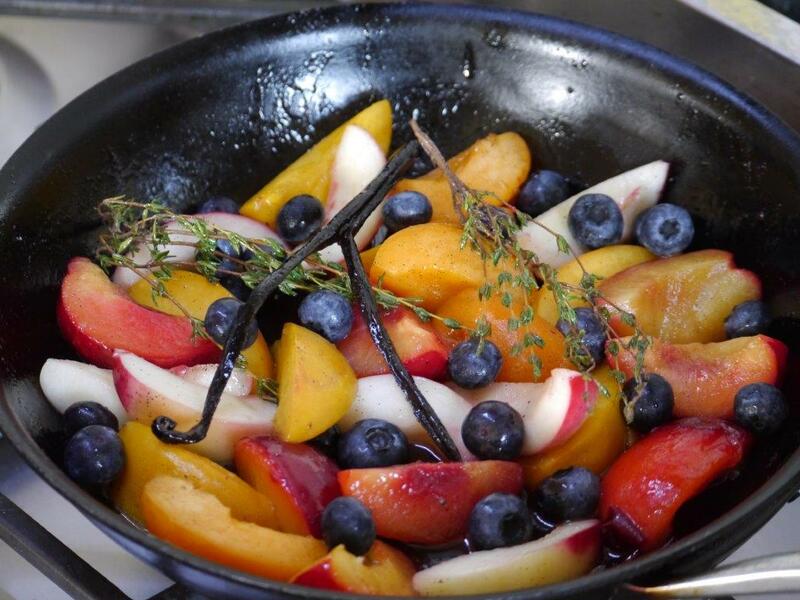 If you’d rather roast the fruit then make the syrup in a small pot, put the fruit in an oven dish, pour over the syrup and bake for a few minutes till the fruit is soft. Place the yoghurt in a bowl and stir in the lemon curd. Cover and put in the freezer for 4 hours till frozen. If you can, stir it every hour. After 5-6 hours it’ll be quite frozen. Before serving take it out of the freezer for at least 5 minutes.